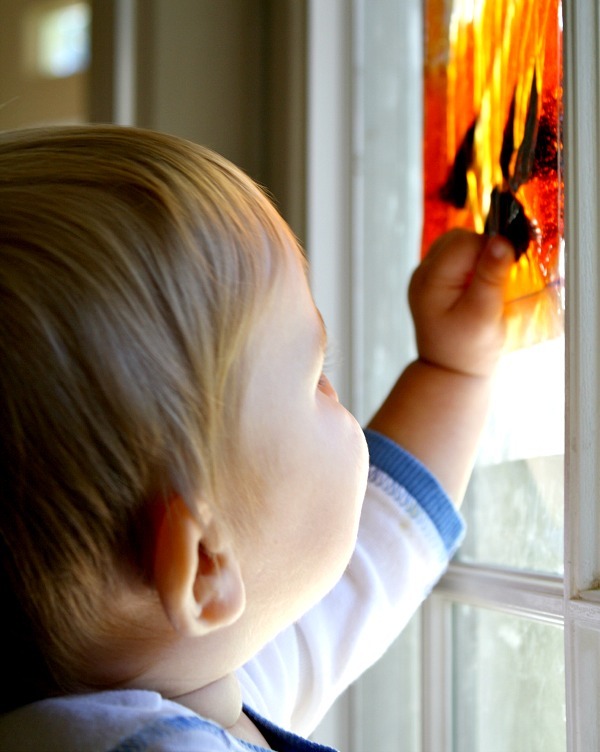 Looking for a fun Halloween activity for babies and toddlers? Squish bags are great for this age. 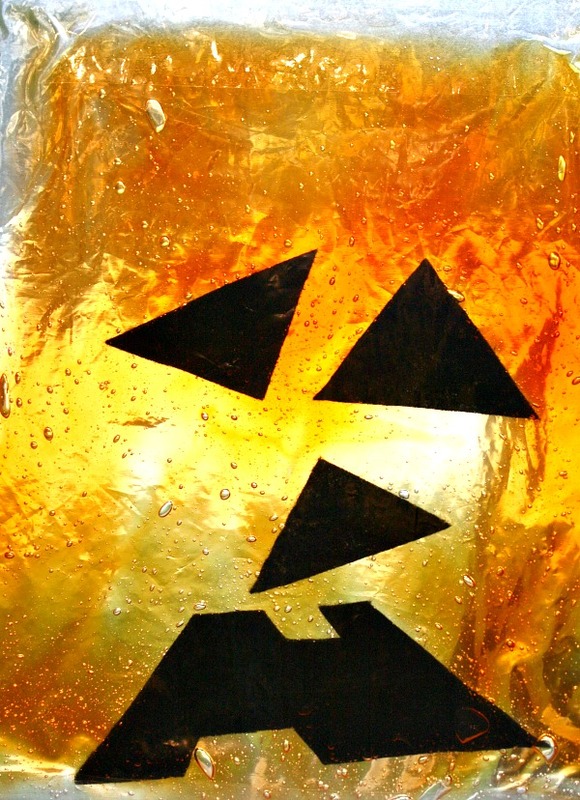 Try a jack-o-lantern squish bag (or sensory bag). They take about two minutes to put together, and kids just love to play with them. This is one we made last year, and I’m excited to put together some new ones again this year. Sensory bags are super simple to make. Teach Preschool has an excellent sensory bags post that explains how to put them together and a tip for removing the white writing from the plastic bags. 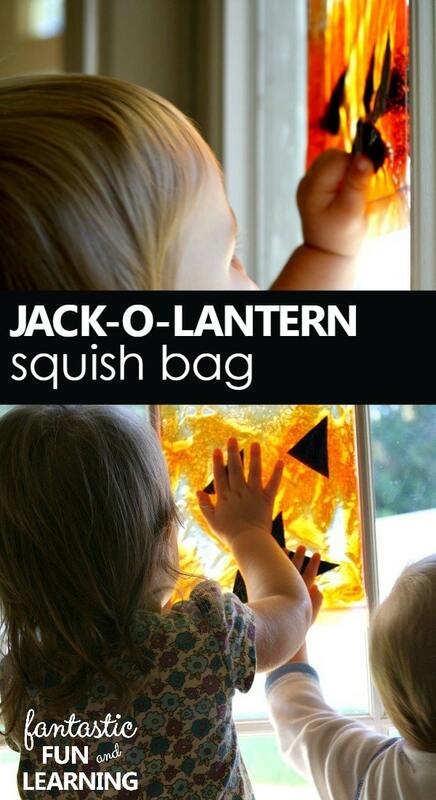 This post was the one I used to create our jack-o-lantern squish bags. I also saw these eyeball sensory bags that were made with corn syrup if you have that on hand instead of hair gel. For this squish bag, I added a few drops each of red and yellow liquid food coloring and pieces of cut up black felt to make a jack-o-lantern. Black foam would also work if you have that on hand. 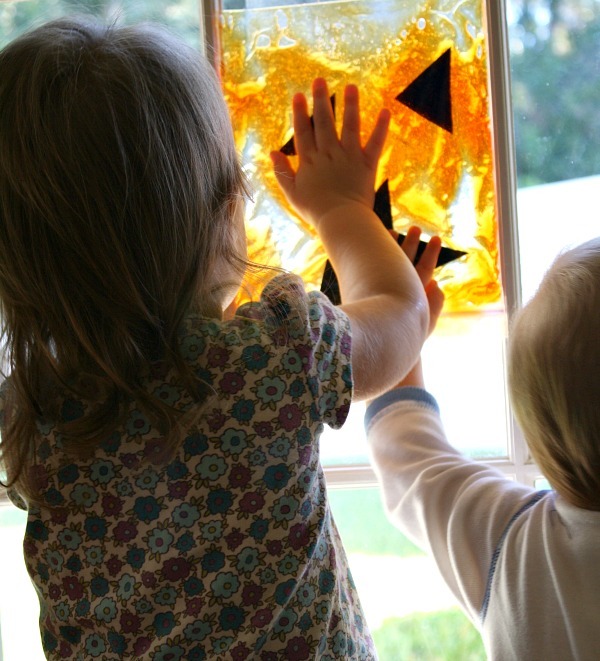 I used clear packing tape to seal the edges and then taped the sensory bag to the window so we could see the sunlight shining through. You could also leave the bag flat on a table for kids to explore. The baby was the first to notice the squish bag, and he spent a lot of time observing the tiny bubbles in the bag. Then he poked and squished to make the gel and the foam pieces move around. He visited the bag over and over again while it was up. Tinker also spent a lot of time exploring the squish bag. She liked the cool feeling of the gel through the bag. 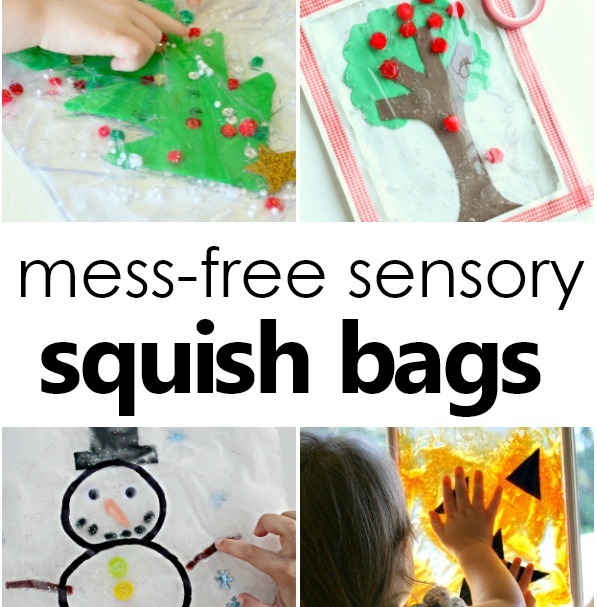 Even the preschoolers couldn’t resist playing with the squish bag. I may have spent a few minutes playing, too! Happy Hooligans also has another fun twist on fall squish bags. This is so cute! My little girl would love this. I think I have all of the ingredients on hand to make it today. Thanks for sharing. Thank you! I hope your little girl had a great time! Thanks so much for adding this to your round-up. Glad you liked the activity! Very cool idea! 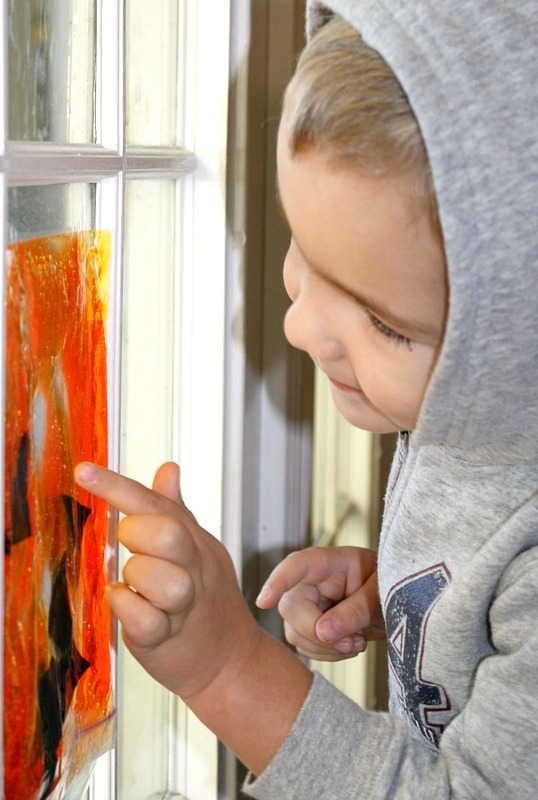 I will be doing this today with my daycare children o this wet rainy day! So cute! We’ve done sensory bags before but I just *love* this idea to make a jack-o-lantern face with it! 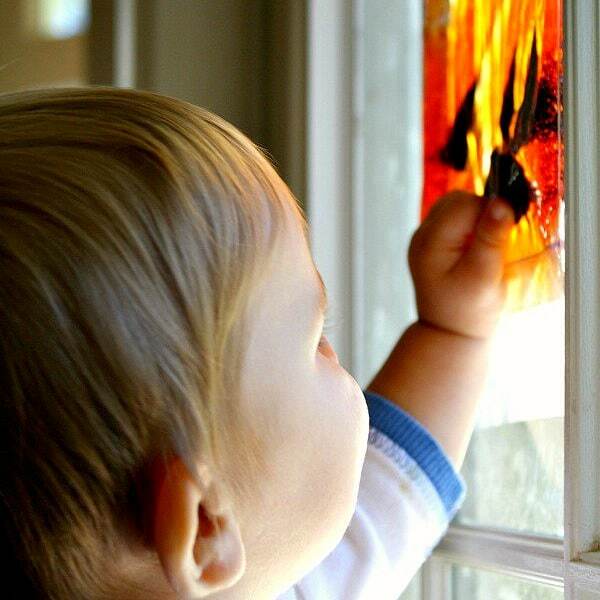 I love how a little change can make things new again and encourage different explorations for kids. Sensory Bags – such fun! This would be great for my littlest as he is still unsure of the real messy stuff … a great way to get him used to the messy fun he is bound to have at home!! I absolutely agree, Sarah! 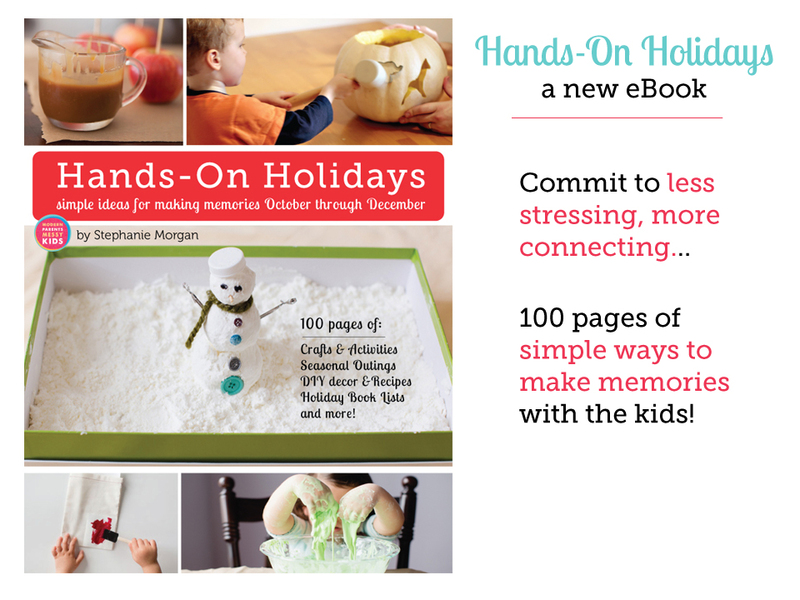 This is a great starting point for kids who aren’t quite ready to dig into the messy play activities. Little Buddy feels the same way about certain materials so far.